This is an article that looks at the name given to a group of crows and some of the interesting history that is attributed to this very intelligent bird. What does it mean, Murder of crow? Why are crows associated with death? These are some of the things that intrigue us about these birds. They are known around the world. They are represented in many native cultures globally, and yet they persist. They are remarkably intelligent, enduring, and social. When birds are seen together in groups, they have a particular name associated with the description. When parrots are seen together, they can be referred to as a Flock of Parrots. Oddly, Seagulls are not called a Flock. They are called a Colony. A group of hummingbirds is referred to as a charm. A group of starlings is referred to as a chattering, and for good reasons too. A group of mallards flying is called a flush, but ducks that are on the water are called a paddling, or if, in a tight group swimming, they may be referred to as a raft. If you have had the chance to see wild turkeys as they scour an area looking for food, then you have seen a rafter of turkeys. The crow, on the other hand, has a much more diabolical name than any other species of bird.. A group of crows is referred to as a Murder. The crow has an odd and unique history that is rich in lore and allegoric symbolism. The crow and their cousin the raven are perhaps two of the smartest creatures to inhabit the earth. The name murder, which is given to crows, does not have a clear origin or beginning. Yet, they are associated with death in many cultures. This probably attributed to the fact that the crow inhabits every corner of the globe with the exception of the polar regions, and are scavengers. The diabolic nature of the crow is noted and similar from one country to the next. The crow has an odd way of looking at your, into you and being very patiet as they wait for you. until the label is firmly adhered to the bird. The reality of the crow is very different from the perception. Crows are complex and caring creatures... if you are a crow. They have vocabulary, and they actively speak to each other. Their language is rich and consists of 250 plus calls or phrases. 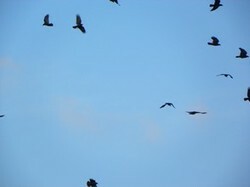 They respond to cries of help and will pitch in to save a crow that is not known to them. Above all of this, however, is the fact that crows will mate for life. Throughout history, the crow has been seen to gather in groups and openly discuss the fate of injured or weaker members of their group. It is interesting that they decide fate together rather than singularly. This is not the usual case when animals of the same species fight to the death. A weak crow may put the entire murder at risk. A sick crow may spread disease throughout the murder. The crow are somewhat remarkable in that they defend each other from predators. One murder of crow will also come to the aid of a single crow that is not part of their family group. This reinforces the fact that are intelligent, and that they use language. Because the crow is a scavenger and I might add a lazy opportunistic bird to boot, it will find a meal wherever it may. The crow has long been associated with human war and carrion birds who feed off of the dead soldiers. They are also known to fly in their murder over a potential meal. They share this trait with the buzzard. Due to the fact that the crow is a smart bird, they have been witnessed throughout history following armies. The constant squawking and bickering becomes etched into the minds of soldiers. attribution to their association of murder. People have feared the crow as Poe discerns in his poetry. They are associated with the calling of death to the wary and worried and may even be seen as a sign of impending doom. it. The resulting curse forever turned the crow from white to black. Apollo's anger was that the bird did not defend his human lover from her lover by pecking out the mans eyes. This was an interesting read. I've encountered the term "murder of crows" before, but never really thought about the origin of this term. It makes some sense. I love crows. They're some of my favorite birds. Where I live, we have two species of crows, but no ravens. I love the fish crows, with their funny nasal voice; they're more tame than regular American crows, maybe because their tendency to hang around water rather than agricultural fields gives them less experience being shot at by farmers. I relate to them a lot because they seem very sociable, strong-willed, and curious. They seem a lot more like my personality than most birds.